Fifteen years ago, the discovery of inflammasomes was a breakthrough in our comprehension of how inflammation is set off1. Inflammasomes have since been shown to play key roles in various pathophysiologic conditions and therefore constitute a major target for drug development. This review focuses on the central function of inflammasomes between innate and adaptive immunity. Inflammasomes are tri-partite complexes consisting of a cytoplasmic sensor, an adaptor known as apoptosis-associated speck-like protein (ASC; or PYCARD), and pro-caspase-1. Inflammasomes are defined by their sensor, which include AIM2, Pyrin and NLRP1, NLRP3 and NLRC4 that belong to the NOD-like receptor family2. The diversity and specificity of sensors allow responsiveness to a broad range of stimuli either extrinsic (microbial molecules) or intrinsic (danger signals). The NLRP3 inflammasome is the prototypical and best characterized inflammasome. Its activation is a two-step process. A first signal (‘priming’), provided by microbial molecules such as lipopolysaccharide (LPS), induces NF-κB-dependent expression of NLRP3 and pro-IL1β. The second signal, provided by various structurally unrelated microbial molecules (e.g. toxins) or danger signals (e.g. monosodium urate (MSU)), triggers inflammasome multimerization. NLRP3 promotes ASC aggregation into specks leading to caspase-1 self-cleavage and activation. Active caspase-1 induces the proteolytic maturation of IL-1β and IL-18, and cleavage of Gasdermin D (GSDMD). Subsequent GSDMD pore formation at the cell membrane elicits a rapid pro-inflammatory form of cell death called pyroptosis. This event, associated with the release of IL-1β, IL-18 and alarmins such as HMGB1, contributes to the propagation of danger signals beyond the damaged or infected cell, notably by recruiting neutrophils2,3. Moreover, oligomeric inflammasome particles can be released to further amplify the inflammatory response after phagocytosis by surrounding macrophages4. Interestingly, IL-1β secretion can occur independently of pyroptosis in intact living phagocytes in a state of ‘hyperactivation’5,6. Indeed, inflammasome-induced hyperactive dendritic cells (DCs) trigger enhanced T-cell responses: besides retaining their function of antigen presentation, they contextualize T helper cell responses through the secretion of IL-1β and IL-18. These cytokines were shown to preferentially drive Th1/Th17 responses. IL-18 amplifies IFN-γ production by primed Th1 cells and strengthen their Th1 differentiation, while IL-1β promotes Th17 polarization and IL-17 secretion. IL-1β also improves survival of naive and memory T cells7,8. Th17 responses driven by inflammasome-dependent IL-1β are essential for host defense against fungal infections. Recognition of fungal pathogens such as Candida albicans by Dectin-1, a C-type lectin receptor that senses β-glucans, leads to Syk-dependent NF-κB activation, NLRP3 inflammasome assembly and IL-1β-mediated Th17 responses resulting in effective anti-Candida immunity9,10. Of note, Dectin-1 signaling also triggers IL-1β production via a non-canonical caspase-8 inflammasome9. The divergent functions of IL-1β and IL-18 in shaping adaptive immunity has drawn much attention to inflammasomes for vaccine adjuvant development. Th1-mediated humoral responses, Th1/Th17/cytotoxic T cell immunity and immunological memory may be manipulated with inflammasome-activating ligands11. For example, combining induction of type-I interferons (IFNs), known to inhibit pro-IL-1 synthesis and favor IL-18 maturation, with activation of inflammasomes in DCs is a promising way to achieve protective Th1 responses12. Such combination may be obtained with certain particulate vaccine adjuvants such as the cationic polysaccharide chitosan. It was recently found to induce type-I IFN production and NLRP3 inflammasome activation leading to robust Th1 responses13. Further studies are still needed to better understand the role of inflammasomes in adaptive immunity and for the development of improved vaccine adjuvants. 1. Martinon F. et al., 2002. The inflammasome: a molecular platform triggering activation of inflammatory caspases and processing of proIL-1β. Mol Cell. 10:417-26. 2. Broz P. and Dixit V.M., 2016. Inflammasomes: mechanism of assembly, regulation and signalling. Nat Rev Immunol. 16:407-20. 3. Kovacs S.B. and Miao E.A., 2017. Gasdermins: effectors of pyroptosis. Trends Cell Biol. 27:673-84. 4. Baroja-Mazo A. et al., 2014. The NLRP3 inflammasome is released as a particulate danger signal that amplifies the inflammatory response. Nat. Immunol. 15:738-48. 5. Broz P. et al., 2010. Differential requirement for caspase-1 autoproteolysis in pathogen-induced cell death and cytokine processing. Cell Host Microbe. 8:471-83. 6. Evavold C.L. et al., 2018. The pore-forming protein gasdermin D regulates interleukin-1 secretion from living macrophages. Immunity. 48:1-10. 7. Evavold C.L. and Kagan J.C., 2018. How inflammasomes inform adaptive immunity. J Mol Biol. 430:217-37. 8. Zhu J. et al., 2010. Differentiation of effector CD4 T cell populations. Annu Rev Immunol. 28:445-489. 9. Tang J. et al., 2018. Regulation of C-type lectin receptor-mediated antifungal immunity. Front. Immunol. 9:123. 10. Geijtenbeek T.B.H. and Gringhuis S.I., 2016. C-type lectin receptors in the control of T helper cell differentiation. Nat Rev Immunol. 16:433-48. 11. Muňoz-Wolf N. et al., 2017. The role of inflammasomes in adjuvant-driven humoral and cellular immune responses. Immunopotentiators in Modern Vaccines. 23-42. 12. Dostert C. et al. 2013. 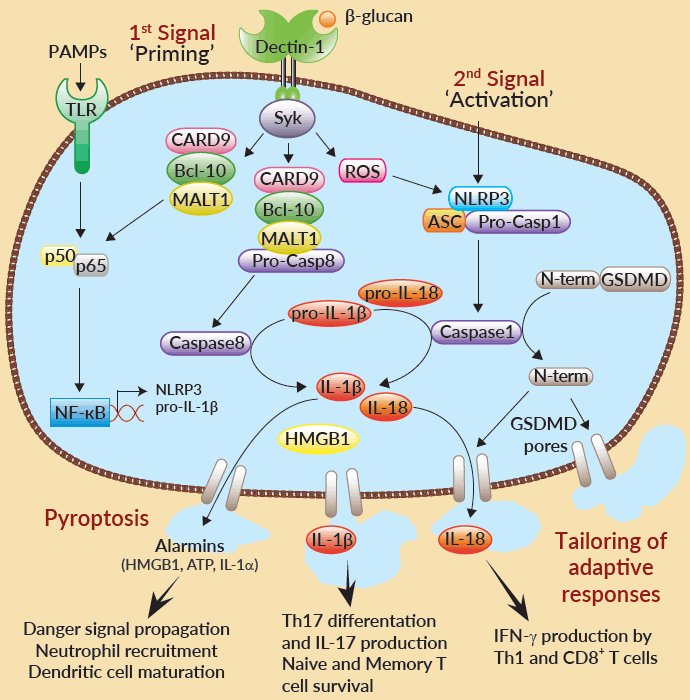 Innate and adaptive effects of inflammasomes on T cell responses. Curr. Opin. Immunol. 25:359-65. 13. Carroll E.C. et al., 2016. The vaccine adjuvant chitosan promotes cellular immunity via DNA sensor cGAS-STING-dependent induction of type I interferons. Immunity. 44:597-608.